A local politician and comic-book-store owner in Spokane, Washington, hopes his StarCraft-themed campaign will net him a win. Meet John Waite. John Waite is a bona-fide nerd who owns a comic book store called Merlyn's in Spokane, Washington. In addition to his career as comic book guy, John Waite wants to run for public office as part of the Spokane City Council. That's nothing out of the ordinary at all, of course. Plenty of local politicians start as members of the community in which they're running - it's why they're particularly invested. 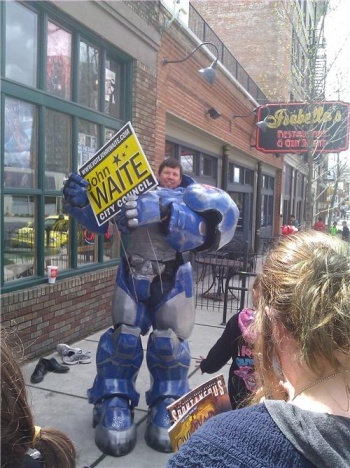 What is out of the ordinary is that Mr. Waite is campaigning outside of his store while dressed as a Terran Marine from StarCraft. It's actually a pretty accurate costume, too - he didn't paint some cardboard blue and slap it on his shoulders and call it a day. No, it seems that John Waite is entirely committed to his StarCraft-themed campaigning. Or on the other hand, maybe he was putting together his BlizzCon costume and thought he'd put it to good use beforehand. Either way, really. In all seriousness, this picture was snapped on Free Comic Book Day, which meant that Waite probably knew that more people than usual would be visiting Merlyn's. Since the sort of people participating in Free Comic Book Day are more likely than not to be sci-fi fans, this was actually a fairly calculated campaign for the man. At time of writing, there is no word on whether or not John Waite is in favor of Stimpack legalization and national Zergling Rush defense. Edit: The actual Terran Marine armor was created by Tony Malcom and his wife over 4 months, and made its debut at SakuraCon 2011. Nifty stuff.